Keith Kerr from Shakespear Road, Milford is another happy customer with his roof edge protection in place for the painters to do tile repairs and painting. Roof scaffolding, edge protection using tube and clip is a big part of our winter work schedule. The St Heliers Shrink Wrap encapsulation is now complete and just in time with all this rain. Rebuilds can be time consuming with multiple tradesmen working at once and with this full shrink wrap there will be no delays. The scaffold structure is now complete for this St Heliers property to be shrink wrapped. With a use of Kwik Stage scaffold, beams and Tube and Clip scaffold ensuring stability and protection from this high elevation looking over the Waitemata Harbour. When the Riverhead Scout Den needed a new roof they contacted All Scaffolding to erect the roof edge protection safety railing. This tube and clip system works a treat to get the job done right. 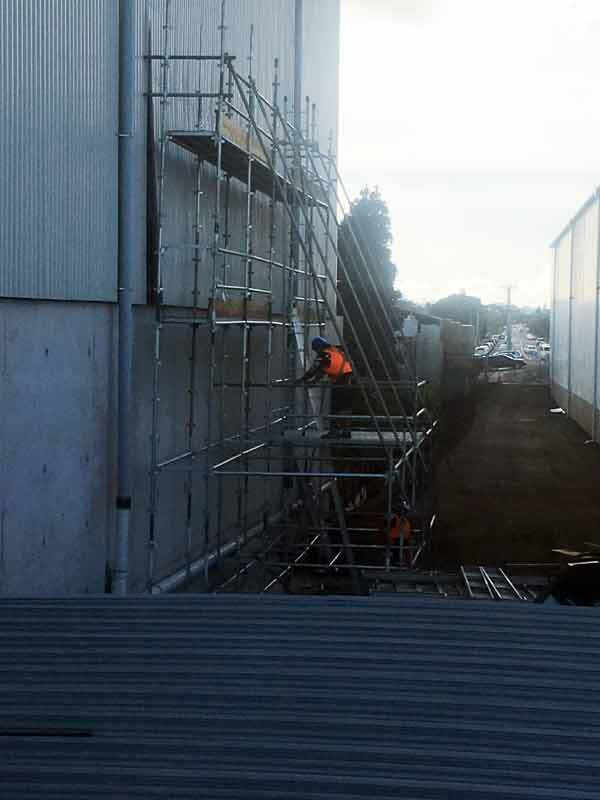 This week we assisted Winstone Wallboards with support scaffold for recladding after the wall collapsed due to over filling the gibb shed. The support scaffold will ensure the wall doesn't collapse. A buttress bay adds the extra scaffold support and gives the structure strength.